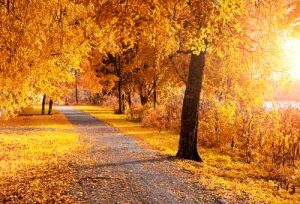 As much as anything, fall offers us another chance to get it right and another chance to think about what that really means. In this time of endings and beginnings, we put the garden to bed for the winter, gather up and dispose of summer’s answer to springtime’s promise, and once again prepare the earth for a new carpet of green that we can only hope will cover the bare spots in the lawn. Done right, these chores should produce a tidy landscape where nature can work her magic over the long, cold New England winter just so the cycle can begin all over again in the spring. Our yard is a small plot of land, thick with pine, oak, and maple trees around the edges of a patch that we leveled with the fill from the basement of a family room that we added many years ago. Despite its small dimensions, the land has always produced 100 bags of leaves every year no matter how many trees were lost to storms and our more deliberate plans to change our environment. You would think that fewer trees would produce fewer leaves, but I am not one to argue with nature’s miracles of abundance, so I just buy more leaf bags. When I started tending this patch of land 40 years ago, getting it right meant gathering all of the leaves and carting them off to the town dump. The result was a neat, clean, almost surgically pure yard and muscles pleasantly sore from use in the bracing air. One year we piled the leaves on tarps and dragged them to the curb where a man we hired collected them and hauled them to the dump. Getting it right became just a bit easier by eliminating the half dozen or more trips across town that it took to bring the leaves to their final resting place. Before long, we did away with hauling altogether and piled the leaves in a far corner of the yard where nature’s slow, silent fire turned them into rich, brown earth that we used to enrich the soil for plantings in other parts of the yard. For many years, this solution was perfect until we lost the will to keep up with the growing compost pile, and it became more of an eyesore than a benefit. Now, 40 years later, we are getting it right by going back to our original strategy of bagging and hauling our leaves away – all 100 bags every year, no matter how many trees are remain to produce them. When it comes managing the autumn leaves, getting it right is clearly a moving target. It is not so much a matter of finding the single right way to accomplish the task as it is a question of discovering what is right for us at a particular time under a particular set of circumstances. No matter what strategy we use, the outcome is the same. The fallen and scattered leaves are collected and put out of sight, leaving a clean workbench where nature’s alchemy will produce new growth in the spring. We hope that this new growth will be grass – a thick, luxurious, verdant carpet – the perfect backdrop for our spring flowers. Here’s where getting it right becomes a bit trickier, when the right method is measured by the right outcome. By the time fall comes around, whatever grass we had in the front yard has been overwhelmed by a progression of various weeds and crabgrass. Our efforts to control these invaders with chemicals and old-fashioned weed pulling have left wide swaths of empty soil that need to be replanted if we have any hope at all of ever getting the lawn right. We need the right seed, the right fertilizer, and the right amounts of sun and rain at precisely the right time for any of this to work. If it doesn’t, we can always try again in the spring, unless of course we choose to apply crabgrass preventer, which also prevents new seed from germinating. This year, as I water my newly planted lawn, I am encouraged to see green shoots of new grass sprouting from the mix of seed, mulch, and fertilizer. But I have been here before, and I know there is a long way to go before I can begin to think that I finally got it right. So, I think instead about what getting it right means. I recall a recent conversation with a family friend about the heartbreak of parents whose children choose a path in life at variance with their family’s values. She knows exactly why things like this happen and says she would like to meet parents in this situation so she can tell them how to prevent such heartache. Like so many others, she is convinced that she has discovered the simple answer to a complex problem, and she is happy to share the secret of getting it right. A colleague tells me about a patient who politely cancelled his second appointment because he did not feel they were a good match. My colleague thinks about what he might have done differently in their first meeting to make a better connection, but concludes that despite our best efforts, sometimes these things just don’t work out. Psychologists and professionals of every kind have an obligation to get it right, at least in the sense of knowing and using the best practices of their trade. I hope our air conditioning specialist got it right when he installed our new system last fall and that my doctor is right about his recommendations to keep me healthy, but there are no guarantees. When it comes to getting it right, the only thing we can rely on is the knowledge that we are doing our best for the right reasons. As for the outcome, we can only hope for success, be ready to try again if we fail, and be thankful for as many chances as we can have to get it right.